The Crown Prince will ascend the throne on May 1, 2019. 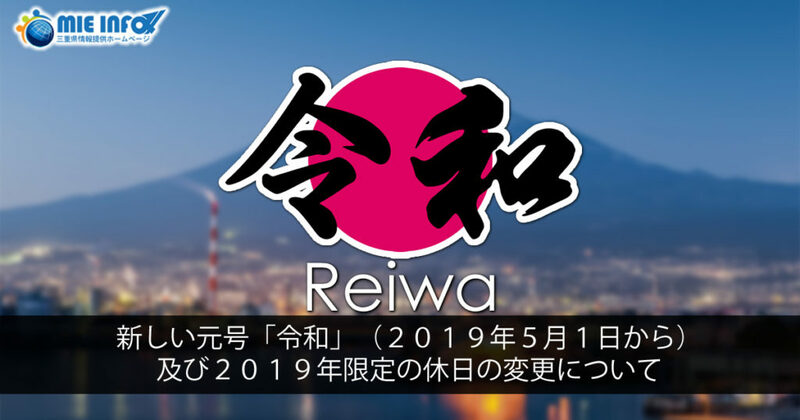 From that day onwards, the “Heisei” era will end and the new “Reiwa” era will begin. The name “Reiwa” is taken from the “Man’yoshu” which is the oldest anthology of classical Japanese “waka” poetry. A gengo is the name given to the era like “Showa” or “Heisei”. In Japan, the “Taika” era in the year 645 was the first named era. Currently, the era changes when a new emperor succeeds the throne. In accordance with the Emperor’s abdication and the prince’s ascension to the throne, May 1 and October 22 will be one-time public holidays in 2019. April 30 and May 2, 2019 will also be one-time public holidays. The annual Emperor’s Birthday holiday will move from December 23 to February 23. *There will be a 10-day consecutive holiday from April 27 (Saturday) to May 6 (Monday). During this period, places such as the prefectural government offices, city halls, immigration offices, embassies, etc. may be closed or have reduced hours, so please check in advance.